A quick sketch on a cold day. 45 minutes, standing outside the “Indigo Coffee House”. Nearby, bicycles were parked on the fence surrounding the church of St Edward, King and Martyr. I wanted to catch the bright sunlight in Kings Parade, seen from the relative darkness of St Edwards Passage. Built 1935-38 designed by Lubetkin and the Tecton Architectural Practice. Partly restored mid 1990s, but still looks dilapidated, especially round the back. Evidently still in use as a medical centre. While I drew the picture, ambulances arrived and departed, carrying elderly and disabled patients. A mother and child looked at my drawing. The mother encouraged the child to see how slowly I was drawing. Posting this in 2019, after I went to the Wellcome Collection “Living Buildings” exhibition, and learned how carefully this health centre had been thought about. There was a mural inside, which was destroyed in the Second World War. 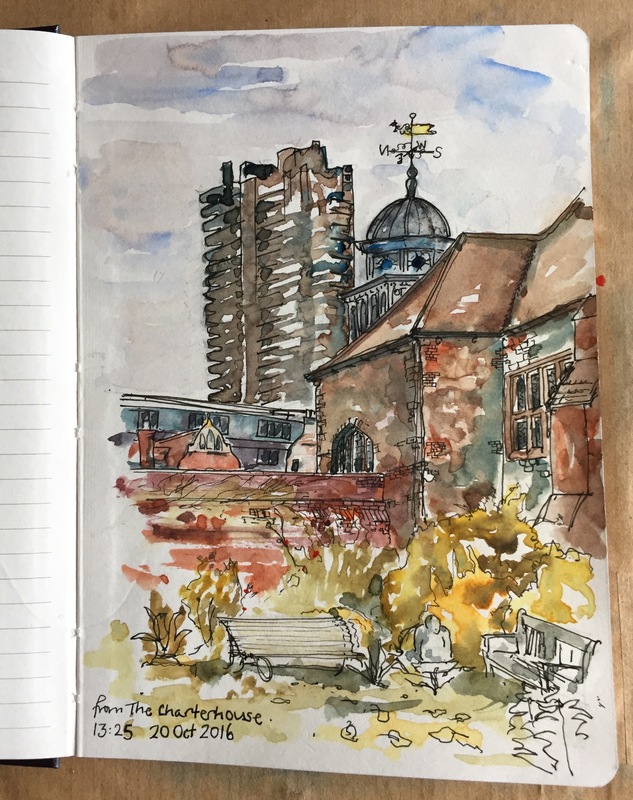 This is my first sketch at The Charterhouse, as a guest of the Preacher, Reverend Robin Isherwood. The building on the right is the Great Hall, Tudor, around 1600. Beyond it is a Barbican tower, 1970s. A woodcut of the actor John Hurt, 22 January 1940 – 25 January 2017. 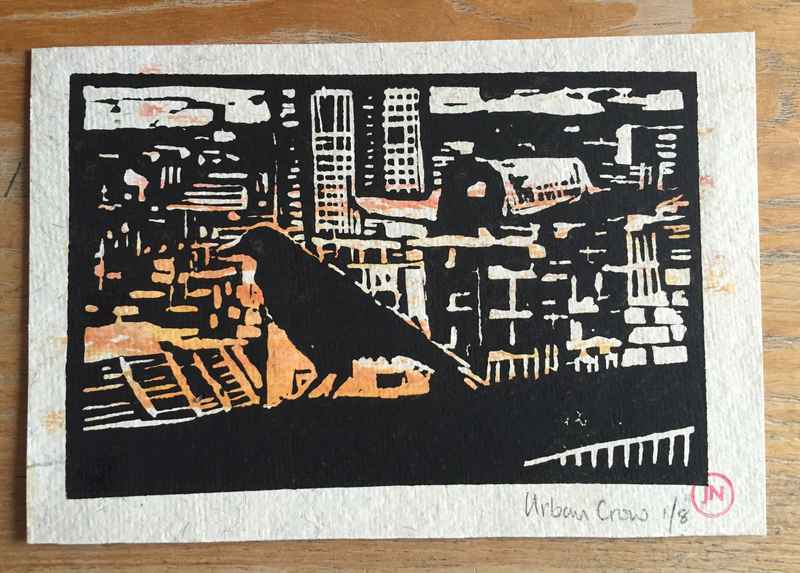 Woodcut and print created at the Art Academy Bermondsey, 21 March 2016. Here are some of the collage postcards I have made. If possible I also make it interactive: it has moving parts, or a part that must be removed by the recipient. This work is inspired by the work of Martin Hicklin.